This article is about the Sega Genesis game. For the SNES game, see Disney's Aladdin (Capcom video game). Disney's Aladdin is a platform game based on the 1992 film of the same name developed by Virgin Games and Disney Software. The game was released by Sega for the Sega Genesis on November 11, 1993 as one of several games based on the film, including another game that was released in the same month by Capcom for the Super NES. The game is one of the best-selling Genesis games with four million copies sold. It also received a number of adapted ports for other platforms, such as the NES, Game Boy, Amiga, and DOS computers. Development for the game began in January 1993, with a team of ten animators working on the animation frames. The work was then shipped to Virgin's California facility to be digitized. The game used traditional animation, which was produced by Disney animators under the supervision of Virgin's animation staff, including animation producer Andy Luckey, technical director Paul Schmiedeke and animation director Mike Dietz, using an in-house "Digicel" process to compress the data onto the cartridge. Virgin was given the deadline of October 1993 to complete production as to coincide with the home video release of the film; this deadline left Virgin with about three-quarters the normal amount of time to build a game. The game features some musical arrangements from the film, along with original pieces composed by Donald Griffin and Tommy Tallarico. The Amiga and DOS were based on the Mega Drive/Genesis version, featuring enhanced music and sound effects. The NES received a port as well, which was later adapted into a Game Boy version, which was compatible with the Super Game Boy. A Game Boy Color port was developed by Crawfish Interactive and published by Ubi Soft on November 30, 2000. A Sega CD version of Aladdin was planned but never started official development. In a "Devs Play" session with Double Fine in 2014, Louis Castle, co-founder of Westwood Studios who later worked on The Lion King, revealed that the studio had pitched a second Aladdin game that would have featured pre-rendered 3D sprites, around the same time as the Amiga game Stardust and a year prior to their use in Donkey Kong Country, but the project was scrapped by Disney. On release, Famicom Tsūshin scored the Genesis version of Aladdin a 35 out of 40. The game was awarded Best Genesis Game of 1993 by Electronic Gaming Monthly. They also awarded it Best Animation. The game was reviewed in 1994 in Dragon #211 by Jay & Dee in the "Eye of the Monitor" column. Both reviewers gave the game 5 out of 5 stars. Mega placed the game at #12 in their Top Mega Drive Games of All Time. Levi Buchanan of IGN gave the game an 8/10, calling the game "a platformer that proved the Genesis, while aging, was still quite capable of great gameplay and delightful artwork." The game sold 4 million copies worldwide at the time of its release, making it the third best-selling Sega Genesis game of all-time, after Sonic the Hedgehog and Sonic the Hedgehog 2. ^ Eddy, Andy (July 1993). "Sega, Disney and Virgin Team up on the Genesis Version of Aladdin" (PDF). Video Games & Computer Entertainment. No. 54. pp. 78–80. ^ "Disney's Aladdin - IGN". Retrieved 2018-02-21. ^ Wawro, Alex (2017-10-11). "Check out this deep dive into the source code for Aladdin on Genesis". Gamasutra. UBM. Retrieved 2017-02-19. ^ "How Westwood Made The Lion King, One Of Gaming's Finest Platformers | Kotaku UK". Kotaku.co.uk. Retrieved 2017-07-25. ^ Weiss, Bret Allan. 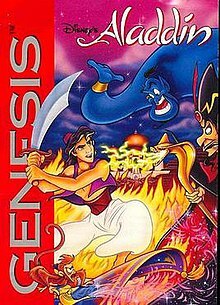 "Aladdin (Sege Genesis) Review". AllGame. Archived from the original on November 14, 2014. Retrieved May 19, 2017. ^ "Aladdin review (Mega Drive)". Edge. November 1993. Archived from the original on May 31, 2013. ^ a b NEW GAMES CROSS REVIEW: アラジン. Weekly Famicom Tsūshin. No.257. Pg.39. 12–19 November 1993. ^ a b Levi Buchanan. "Aladdin Retro Review". IGN. Retrieved April 30, 2017. ^ "File:Mean Machines Sega 14 UK". Sega Retro. 2015-07-02. p. 68. Retrieved 2017-07-25. ^ Horowitz, Ken (2006-03-28). "Interview: Dr. Stephen Clarke-Willson". Sega-16.com. Retrieved 2011-12-26. This page was last edited on 9 March 2019, at 21:17 (UTC).